With the revival of Twin Peaks twenty-five years after it’s original run, David Lynch seems to have popped back up on everyone’s radar. 2017 has brought with it a resurgence in the auteur’s popularity and surrealist appreciation. Showtime, the distributor of Twin Peaks: The Return, announced that the weekend of the premier had the most subscription sign ups in the network's history. In addition, Google searches for film studies 101 surrealist staples Un Chien Andalou (1929) and Meshes of the Afternoon (1943) spiked in the spring coinciding with the premier of Twin Peaks: The Return. The two-hour premiere received a five minute standing ovation from the crowd at Cannes. Perhaps this is a bit of poetic justice for the jeering of Lynch’s Fire Walk with Me at the 1992 Cannes. After releasing his most recent feature film, Inland Empire, in 2006, Lynch has kept a fairly low-profile from a box office standpoint- occasionally contributing to various short films and releasing his 2016 documentary, The Art Life. Fortunately for the surrealist circuit extending from Los Angeles, everyone seems to be talking about Lynch again, giving credence to the movement he’s become synonymous with in no small way. 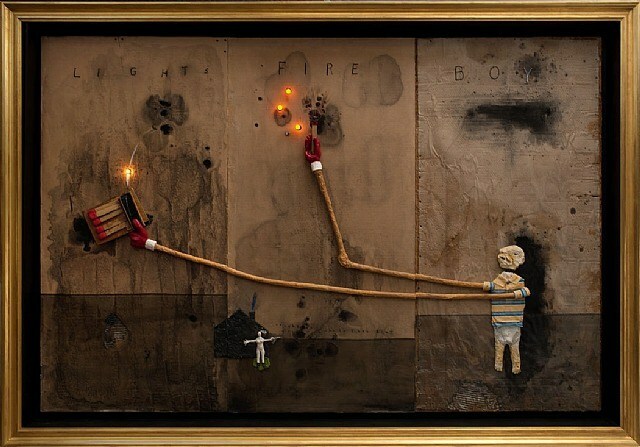 Lynch’s work is often seen as the perfect primer to the broader surrealist movement. Artist Jay Gidwitz, founder and editor of Surrealism Today, even goes so far as to dub Twin Peaks his “gateway drug” to the surreal. Thus, the hope is that through the increased consumption of popular surrealist media like Twin Peaks, the general public will take interest in exploring more of Lynch’s work and the work of other surrealists both contemporary and historical. “People think that the world makes sense, but surrealism is weird. Surrealists think that the world is weird, and your understanding is a fragile illusion. Surrealism continues to resonate because the world and media is getting weirder”, says Gidwitz of the movement’s role in a tumultuous cultural landscape. There is clearly an acknowledgement in surrealist art that reality is thin, and there is a characteristic probing of subjective experience. This has been true since surrealism’s inception as an art form with French writer André Breton. The artists that came before Lynch asked philosophically-loaded questions with their visual style. Dalí, Magritte, and most notably, Francis Bacon influenced Lynch’s work in this way and, subsequently, the future of the surrealist movement. Lynch has often praised mid-century Irish painter Bacon as a primary influencer of his visual art as well as his cinema. There were, however, a handful of non-surrealist art influences for Lynch, namely American realist Edward Hopper whom Lynch cites as an inspiration for his distinct filmic style. Despite his narrative predilection for treacly melodrama, Lynch’s visual art tends away from blood-and-thunder vigor. Instead, the formal decadence of Blue Velvet (1986) is replaced with a naïve, shaky charm reminiscent of Lynch’s first feature-length film, Eraserhead (1977). It is likely this chummy surrealism and the accompanying childlike captions scrawled over the images that endear Lynch’s paintings to viewers. This is not to say that his work isn’t uniquely sinister. Lynch’s subjects may appear whimsically uncomplex, but their relatively simple forms are met with unstaunched violence and distressing imagery synthesized into a kind of gentle absurdity. This particular brand of surrealism continuously shows up in Lynch as a dialectic, combining whimsy and dread as he communicates his internal world and divines meaning from the product. Since the 1960s, Lynch has managed to pull surrealism back into the public sphere, making fashionable the dark underbellies and keening cityscapes of his worlds and bringing slippery dream logic back in style. As for The Return, it’s presence on a major prestige network and subsequent reruns will likely fuel interest in the avant-garde, and if the center holds, surrealism will find validation in Lynch’s popularity.